Adelaide - England's record bowler James Anderson was named as vice-captain for the Ashes series against Australia on Friday, replacing Ben Stokes who is suspended and under investigation over a nightclub brawl. Anderson, 35, who has 506 Test wickets, was promoted as understudy to captain Joe Root ahead of fellow paceman Stuart Broad and ex-skipper Alastair Cook. Coach Trevor Bayliss previously said he was planning for an Ashes series without Stokes, who is running out of time ahead of the first Test in Brisbane from November 23. Stokes remains at home awaiting the outcome of a police probe into his involvement in the brawl outside a Bristol nightclub on September 25. 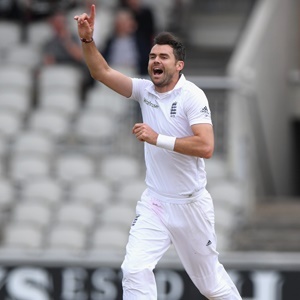 Lancashire bowling great Anderson is embarking on his fourth Test tour of Australia, and he looks likely to play a key role as England's bowlers hit injury problems. Nottinghamshire speedster Jake Ball is to have a scan after he injured his right ankle on Thursday during England's warm-up game against a Cricket Australia XI in Adelaide. It follows a knee injury which ruled paceman Steven Finn out of the tour. Surrey all-rounder Tom Curran has arrived as Finn's tour replacement, while all-rounder Moeen Ali continues to recover from a side strain.